Best Packing Cubes in 2019 To Help You Pack Like A Pro! As someone who’s been traveling for a while now, you could say I fairly experience when it comes to packing my bag, in fact, I’ve been living out of my backpack since 2016. Initially, when I was new to the whole traveling on the go lifestyle I had a lot of trouble packing efficiently. In fact, I hated it! It was super difficult to keep things organized and tidy because I kept messing things up when I had to get something out of it. I soon realized I was doing it all wrong when I discovered packing cubes or a life-enriching travel accessory I should say because once you start using packing cubes there is no going back. In fact, after using packing cubes I knew exactly where I was when I opened my backpack and this was the best feeling ever! 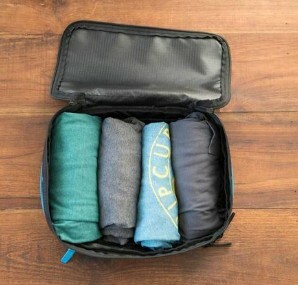 I’m always astonished when I find travelers who do not even know what packing cubes are let alone use them which is why I thought I’d write about the best packing cubes to buy in 2019 and how exactly they helped me so that they can help you pack efficiently whilst traveling. What are packing cubes and why are they important? How I use Packing cubes whilst traveling? Most of the best packing cubes are lightweight made of special nylon and have mesh screens so you can see the contents on the inside. Pro Tip: It’s best practice to get different colored packing cubes to easily differentiate them. It’s super easy to pack with packing cubes, in fact, that’s the sole purpose of getting one! All you have to do is clearly define what each packing cube is for and make sure you use it for the same for instance you can use one specifically for dirty clothes and the other for clean clothes, the possibilities are endless! You also want to roll clothes before fitting them in the packing cube as that ensures the best use of space. This may all sound a little “extra” but don’t worry once you start using packing cubes you will get the hang of it and soon realize you can’t pack without them! 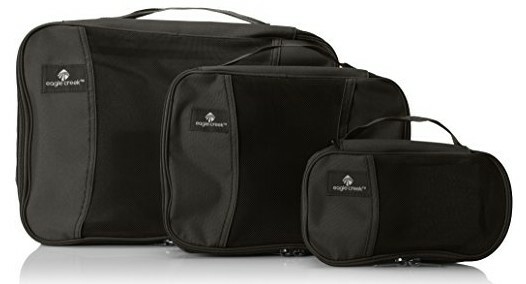 Packing cubes come in mainly small, medium or large sizes. It is possible to find single and double packing cubes too but the size will depend mainly on how you want to use the packing cube. You want to use smaller packing cubes for suitcases and bigger ones for backpacking. Most packing cubes are sold in sets so you don’t need to think too much about them. It’s best to stay away from the cheapest ones as they all come in the same size and isn’t very useful in my opinion. Note: Pay attention to the sizing details as each brand has its own definition for “large” and “medium”. You usually do not need more than three packing cubes but this entirely depends on the kind of backpacker/ traveler you are. So bottom line packing cubes are efficient and can save a lot of time having to pack and repack. I’ve used a bunch of packing cubes and know friends who’ve used certain other so based on my and their experiences I decided to make a list of all the packing cubes that actually work. Eagle Creek is one of the most reputed names when it comes to packing cubes. They are reliable and pretty much at the forefront when it comes to travel products and this is definitely seen in their packing cubes. Eagle Creek is best known for its extremely high quality and they swear by it by offering a lifetime guarantee. You won’t actually need to use it as their products are incredibly strong and compact but it’s definitely good to have. Packing cubes are as good as the quality of their make and Eagle Creek is made of the highest quality nylon that’s also extremely lightweight. So it’s a bit like best of both worlds as you’re getting something that’s extremely durable and compact to fit in the stuff of odd shapes and sizes. Another big player in the travel gear industry has got to be Pro Packing and mainly because of its high-quality products travelers trust and use. They also have a great compact design that can be used in both carry one and suitcases. I mentioned earlier how it was pretty important to have different color packing cubes and you will find many color and size options from PRO packing. The packing cubes have some of the strongest nylon so you can rest assured they will last a long time. The problem with most packing cube companies is that they don’t sell them in complete sets so if you pack heavy you will eventually run out of them. Fortunately, with PRO packing, you get a complete 5 piece set of different sizes (four medium and one extra small cube) which is pretty much more than enough so you don’t have to spend extra on another cube and have issues fitting it all together due to incompatibility issues. Apart from being made extremely high-quality durable nylon these packing cubes offer better compression in comparison to other conventional packing cubes. Although they are not compression cubes this is an added bonus and you’ll save a whole bunch of space. They are also designed to be versatile for instance due to the added compression these cubes can be used for both carry-on and suitcases. This is another decent brand popular among backpackers due to its color combinations and versatile sizing. Why it is worth getting TravelWise Packing cubes? As compared to most competitors TravelWise has kept its pricing quite low especially for a 5 packing cube set. 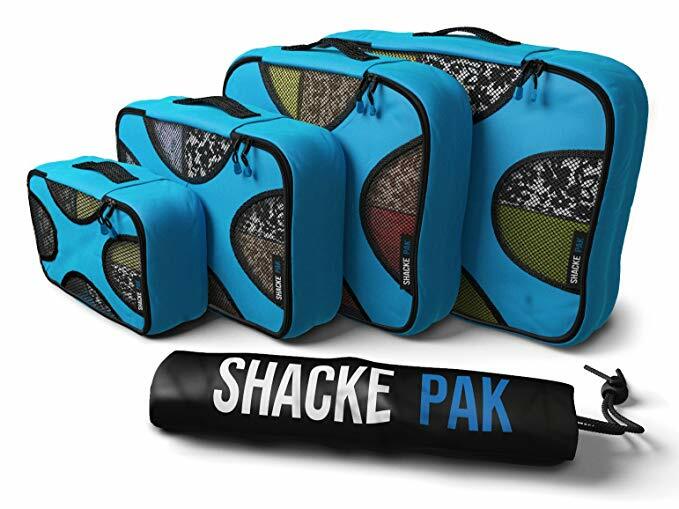 This makes it a popular choice among backpacker that pack heavy and need the use of 5 packing cubes. Apart from having multiple color combinations TravelWise also has a great design with good visible mesh screens that help you easily identify between multiple packing cubes. eBags is quite popular as well due to reliable quality and unique design. Moreover, they offer a lifetime guarantee which makes it a perfect long-term solution for most travelers. Why is it worth getting eBags Packing cubes? The eBags come in a set of 3 different sizes: small to large with each bag made of strong nylon and also machine washable. The nylon fabric is very strong and durable fit with strong zips that makes it possible to squeeze and fit in more without thinking twice as there is no risk of breakage and catching the zip on the clothing. A unique packing cube with one of the best design of the bunch it is also of great quality and quite popular among many travelers. Many travelers buy this packing cube due to its highly durable nature even in water which is a big concern of many backpackers and traveler in general. 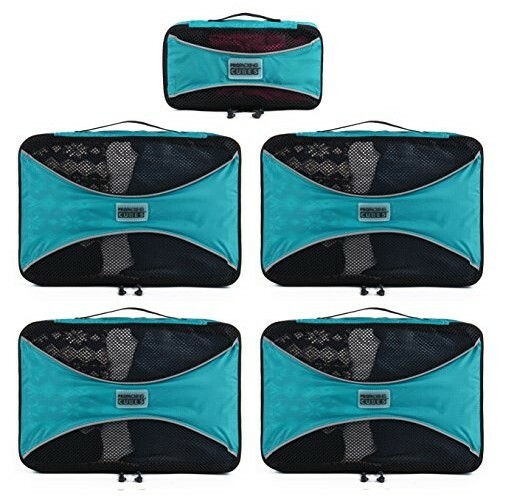 The packing cubes come in a set of 4 with one more additional laundry bag so it’s the perfect solution for anyone looking for the entire package. Moreover, the design is quite well thought out with mesh screens making it easy to see what’s on the inside and differentiate between the packing cubes especially the extra laundry bag. This is the packing cube I use personally as I’ve got the Nomatic travel bag that naturally comes with it. However for those that don’t have the travel bag and still want the Nomatic Compression packing cube you still can purchase it separately and honestly it is simply great to use independently as well! Nomatic and functional are one and the same in fact this is their biggest selling point and the same can be seen in their compression packing cubes. The packing cubes have 2 compartments aside for clean clothes and aside for dirty clothes to help you travel clean and organized. 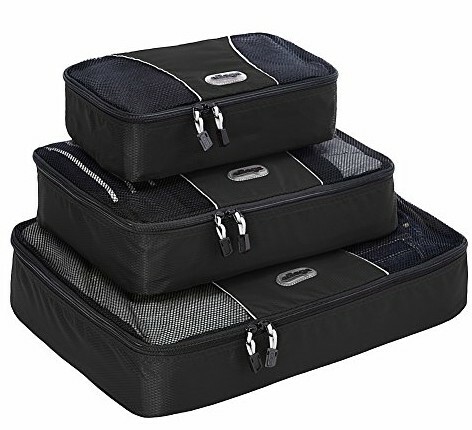 Also, the packing system is designed specially to help you pack more as the central perimeter zipper allows you to compress down up to 3 and a half inches from the original size of 5 and a half inches. Another thing Nomatic is known for is its high quality, in fact, they are so confident in the quality that if you are not 100% satisfied with their product you can simply just send it back and get your money refunded no questions asked! Bottom Line which packing cube should I get? 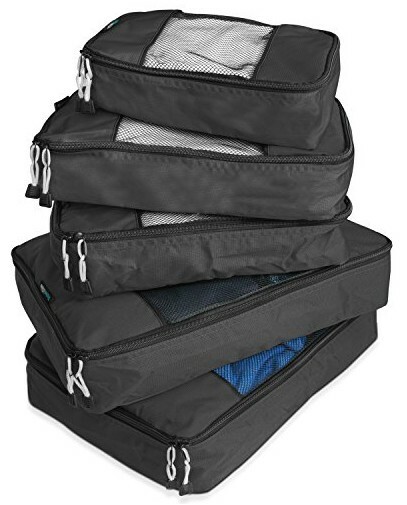 To be honest the packing cubes I mentioned above are all good in their own way and are all of the extremely high quality so you really can’t go wrong with either. I would recommend TravelWise if you are on a budget and the rest are one and the same.